The common pin is about the smallest device we commonly use, a tiny piece of metal with a sharp tip and a small head that holds one thing to another. 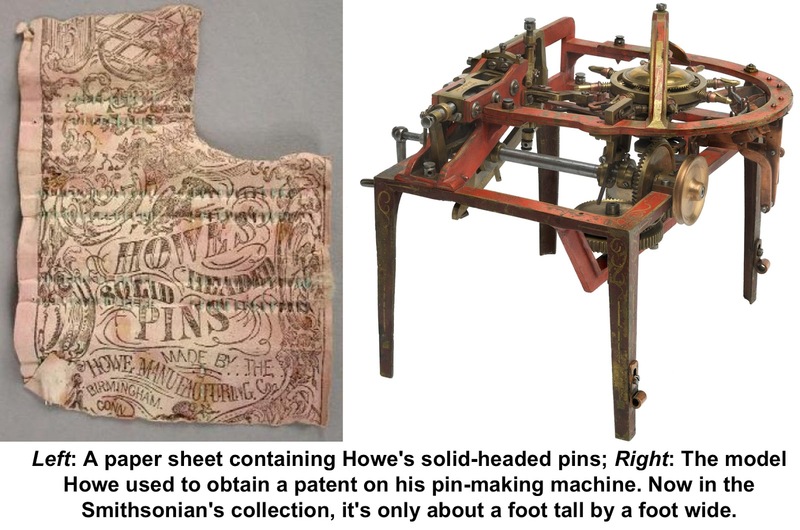 Pins seem simple and insignificant, but to John Ireland Howe, they were the source of his considerable fortune. The Ridgefield native invented the first machine to mass produce them. Howe studied medicine and became a physician at the New York Alms House in Manhattan. There he saw pins being made by the old-fashioned, hand-made way of cutting up wire and sharpening a tip, and adding a head — a process said to require 18 steps for each pin. He set about designing a machine that would manufacture pins, received patents in 1832 and 1833, and with the backing of New York financiers, he opened the Howe Manufacturing Company in Derby in 1836. The company moved to the Birmingham section of Derby, Connecticut, two years later and its pin factory became one of the largest in the country. 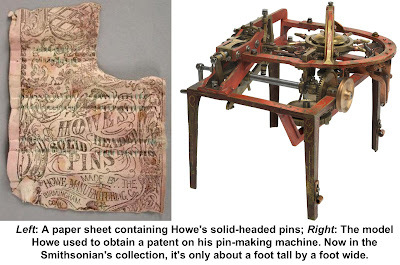 Howe and his staff also invented a machine for “carding” pins — mounting them on heavy paper for sale. The physician’s first foray into the world of industrial inventions was far from pins, however. His familiarity with chemistry from studying medicine led him to experiment on India rubber latex, and put it to practical uses through chemical additives that would make the sticky latex lasting as well as resilient and durable. “So far as I know,” Howe once said, “I was the first person who attempted to utilize rubber by combining other substances with it, but I did not happen to stumble upon the right substance.” The man who did was Charles Goodyear, a native of New Haven whose process for treating rubber latex, called vulcanization, was patented in 1844. 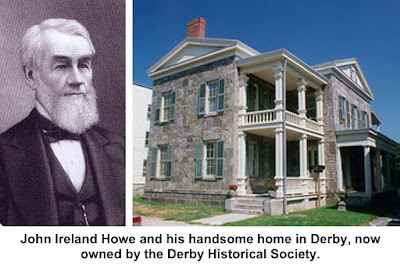 Howe made a fortune on pins, and his mansion in Derby has been acquired by the local historical society which plans to restore it and open it to the public. machine is now in the collection of the Smithsonian Institution in Washington. “His design was mechanically very complex,” the Smithsonian says. “The patent document comprised 20 pages of detailed text and five of diagrams.” Though only about a foot wide and a foot high, the model is extremely detailed. Howe died in 1876 and is buried in Derby. A grandson, John Ireland Howe Downes (1909-1987), was an impressionist painter of some repute, whose work is in the National Gallery of Art. Another descendant, art scholar John Ireland Howe Baur, who once headed the Whitney Museum, was named for the artist, not the pin-maker.